I am almost out the door! Well, with the emphasis on „ALMOST“ ! The german train system has come to a screeching hault due to a strike! My charming hubby has agreed to drive me to the station on the border where I can get directly on the french train, which is hopefully not effected by the german strike! Here is the first peek at my convention swaps. 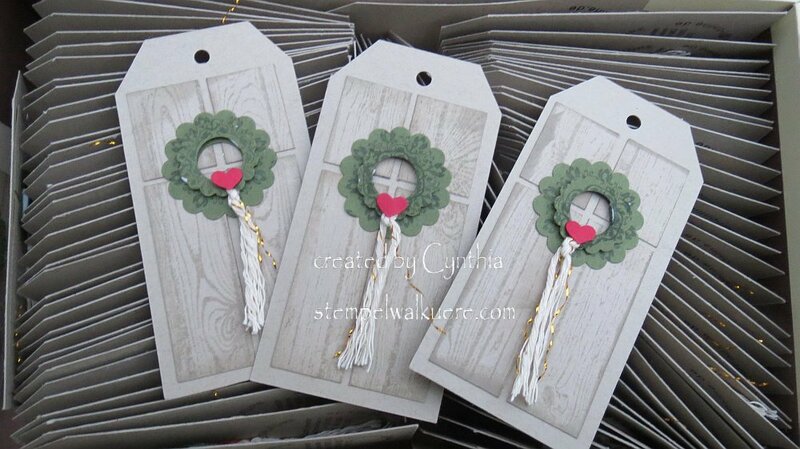 A sweet little gift tag which I have dubbed „from our home to yours“ ! I had to keep my swaps quite small this time because the Stampin‘ Up Convention this year is „en route“ to the music festival in Vivonne, France „VIENNE EN VOIX“ in which I am proud to participate each year! So… knowing that I had to pack my „diva gear“ ( concert gown, music scores etc…) I had to decide on a mini swap. I am actually quite pleased at how it all turned out! Ho -Jo- to- Hooooooooo…and off I go!